I woke to a positively glorious thunderstorm this morning and although there was much to do, I decided it was time to share the legend of the Junkyard Dog. It is very true that one man's trash is another man's treasure. I have evidenced this first hand with the creation of one of my favorite guitars. It is the one that I lovingly refer to as my Junkyard Dog. Many years ago a friend who was cleaning his shop and was throwing out his unused, abused, and abandoned parts. He asked me to take a bunch of guitar parts out to the dumpster and jokingly told me that if some pieces didn't make it, oh well. 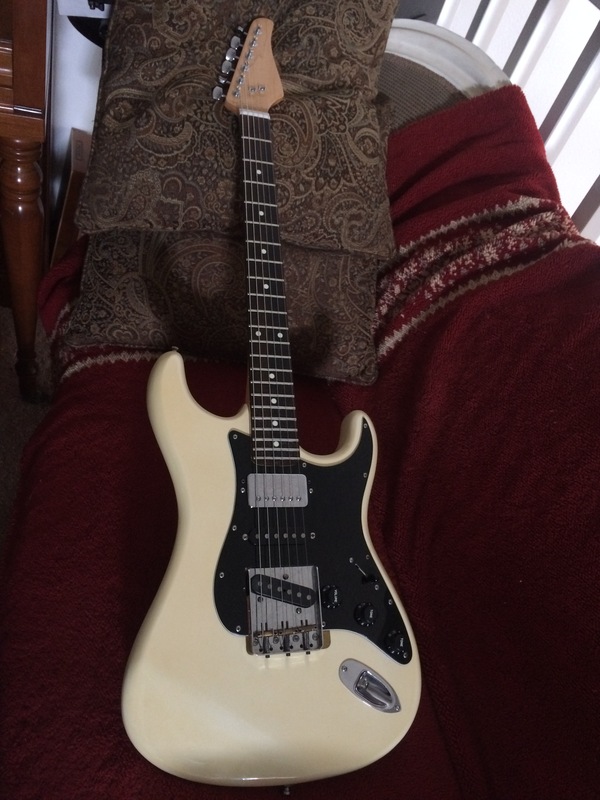 There was a pearl white strat body, a rosewood Kramer neck that was missing the tuners and locking nut and a black pickguard that had been hacked up in its previous life. Needless to say the wheels started to turn and those parts ended up in my garage where they sat untouched for several more years. One day I was in the garage and opened the box of guitar parts and promptly forgot why I was there in the first place. I started taking a closer look at the parts and found them to be completely unless with the body having been routed so poorly as to render it worthless. The mounting point for the brdge was in the wrong location. The neck was equally unusable since it had been set up for use with a Floyd Rose bridge. So I used the parts anyway. The body that had once been pearl white had yellowed over the years. I Used some JB Weld and drywall screws to Plug the body so that I could mounting a Telecaster style bridge plate in the proper location for a 25 1/2" scale length. The saddle pieces were missing so I machined some using 1/4" brass rod chucked in a 3/8" electric drill. Next I fabricated a nut from a left over piece of Corian from a bathroom remodel. Although the pickguard that I had was butchered around the bridge pickup, I cut it out to fit around the tele bradge plate. At this point my net expediture was zero dollars, but I still needed electronics. A trip to visit the local music stores turned out to be very productive. I managed to procure a vintage Telecaster pickup new for $25 and an Epiphone humbucker of indeterminate origin for another $10. But there was still a hole where the middle pickup was supposed to be. Junk box to the rescue! I dug up an old neck pickup from a Telecaster clone, a set of Fender tuning machines, pots, a capacitor, a jack plate, and a jack. Even including the price of a new set of strings, I was still under fifty bucks. Over the years, there have been a few upgrades. Full shielding is a must for all of my guitars, so a roll of copper tape was bought. The middle pickup was replace with a Fender Custom Shop RWRP Texas Special found on eBay for $22, and a DPDTpush pull pot was added along with some wiring tricks. Even after all the years and mods the total momey spent on Junkyard Dog is still well under $100. This is the one guitar in my collection that bears the unique, albeit dubious distinction of being both worthless and priceless. I barely speak the language of your liner notes exploits and labor of love, but I do appreciate the savvy that allowed you to improvise your way into having this one-of-a-kind stringed friend for next to nothing. I think I recognize the JuDo's voice here from other years, other songs, and I feel like him and me go back a fer piece ourselves. Enjoyed the story and the visit! I wish I had the skills to make my own custom guitars from parts... It seems so rewarding, and cost-effective! Alas, I have no such skills, nor the tools to make such things happen. One day, maybe? In any event, you did a fantastic job, as that picture shows me an awesome-looking guitar, and the demo shows me quality sounds! Great work!